1. In luke warm water, add sugar and dry yeast. Cover it and leave for the yeast to activate. 2. Sift flour, add salt, oregano and oil to flour and mix well. Once yeast becomes foamy, add it to flour mixture and make a dough. 3.Knead it for about 10 min. Let it rest for 30-40 minutes. In 30 minutes, it should double its original size. 4. 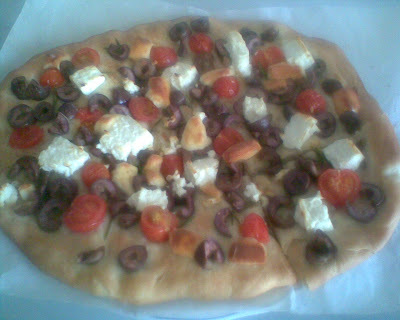 Oil a baking tray and place the dough and shape it with your palms. Add the topping. 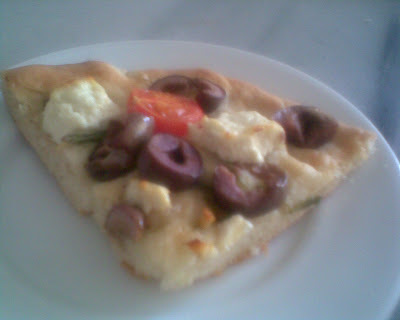 I used olives, cherry tomatoes, white and yellow cheese and rosemary. 5. Bake it for about 25 min in 180C. Enjoy!! !